111 Pecan Street East, San Antonio, TX, U.S.A. The Wyndham San Antonio Riverwalk, formerly a Crowne Plaza property, is situated in downtown San Antonio. 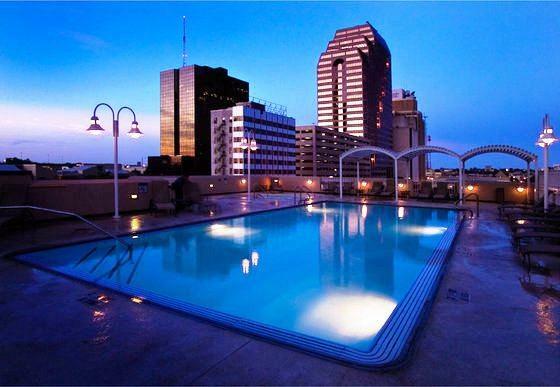 Well located for guests looking to access downtown attractions on foot, the Henry B. Gonzalez San Antonio Convention Center, the Tower of the Americas, the Children's Museum, the River Walk and the Alamo are all within a 15-minute walk. This hotel is 100% smoke free and all rooms include a flat screen TV with pay-per-view movies, a coffeemaker, a desk, an iron and ironing board, a hair dryer and air conditioning. Accessible rooms are available and select rooms also include a sofabed. In-room Wi-Fi is available for an additional fee of $9.95 per 24 hours. Self-parking is available on site for $23.75 per day, while valet parking is available for $28 per day. Pets under 50 lbs are permitted in select rooms at no additional charge (limited to two pets per room). The on-site 111 Bar & Grill serves breakfast, lunch and dinner. Room service is available 24 hours. Other on-site amenities include a rooftop pool and hot tub, a fitness centre, a business centre, 37,000 square feet of meeting and event space, baggage storage and dry cleaning. Verified by a front desk agent on December 12, 2013: Parking, Wi-Fi and pet fees. Among the reviews used for this analysis, many guests seemed generally pleased with their stay at this hotel. Many guests described their rooms as clean and comfortable, while a couple of reviewers praised the views of the city from their rooms. Many reviewers enjoyed the food served at breakfast at the on-site restaurant. The location was found to be convenient, by several reviewers, for exploring the area on foot. Several reviewers complimented the staff for their friendly service, but a couple of guests had concerns about the customer service (see below for more details). A couple of guests enjoyed the rooftop pool, hot tub and fitness centre. A couple of guests thought that their rooms appeared somewhat dated, while a couple of other reviewers complained about paying additional fees for Wi-Fi ($9.95 per 24 hours) and parking ($23.75 to $28 per day). A couple of reviewers complained about noise from rowdy guests, while one reviewer was disturbed by doors slamming in the halls. As mentioned above, a couple of guests experienced inconsistent customer service. While some front desk agents were helpful, a couple of guests said that other agents were unfriendly and disinterested. Expedia.ca gave this hotel an average score of 3.8 out of 5, with 83% of 590 guests recommending the property. TripAdvisor.ca ranked this hotel #155 out of 348 hotels in San Antonio, with an average score of 3.5 out of 5, from 60 reviews. The author called the hotel on December 12, 2013 to verify some information. Rating: #18 out of 297 hotels in San Antonio ranked by guests. An affortable friendly place to stay near the Riverwalk. "The price was absolutely affortable especially when it included the breakfast buffet and parking. Only had to walk a bit to get to the center of the Riverwalk but it was worth it." "Front desk was slow in answering calls. The toilets are a real pain. They have to be flushed several times in some cases. Overall pretty good. The pool wasn't anything to speak of - small and only 3 feet deep. One jacuzzi - was taken over by a mother to use as a waiding pool for her kids. Food was excellent."